Our research team is interested in the study and development of novel "viral sensitizer" drugs that make cells more susceptible to viruses. Our goal is to better understand and use these small molecules to improve the activity and/or production of diverse virus-based therapeutics, including oncolytic virotherapy, viral vaccines, and gene therapy vectors. Dr. Jean-Simon Diallo obtained his bachelor’s degree in biochemistry with honours in bioinformatics from the University of Ottawa in 2000. He went on to Montreal to pursue a masters’ degree in biochemistry at McGill University where he studied the epigenetic regulation of globin genes with the late Dr. Lee Wall. In 2003, he began his Ph.D in molecular biology at the Université de Montréal, in the laboratory of Drs. Anne-Marie Mes-Masson and Fred Saad. There he studied prognostic markers/models for prostate cancer as well as the use of naturally occurring phytochemicals for prostate cancer therapy. 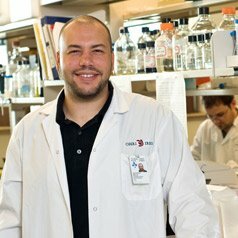 Funded by the Fonds de Recherche en Santé du Quebec (FRSQ) fellowship, he joined Dr. John Bell’s lab as a postdoctoral fellow in 2007, applying his broad expertise and collaborative approach to the field of oncolytic viruses. In Dr. Bell’s group, Dr. Diallo pioneered high-throughput methods to identify compounds that enhance viral replication. Now an Associate Scientist at the OHRI working with a multidisciplinary network of collaborators, he and his team are using medicinal chemistry, mass spectrometry and high-throughput molecular biology approaches to study how “viral sensitizer” drugs work. He is also expanding the scope of application of viral sensitizer drugs, which in addition to oncolytic virotherapy, show tremendous promise in virus/vaccine manufacturing and gene therapy applications.